Finally. Someone who enjoys taking the Lord’s name in vain as much as I do. Please to be meeting Stephen Lindsay, writer and creator of the Jesus Hates Zombies Anthology (for the uninitiated, that’s a graphic novel with a collection of stories) and friend to Great White Snark. Notice the shout-out to Amazing Fantasy 15? You might also know him as the All-Around Solid Dude who helped line up the sweet new Great White Snark mascot graphic, which was created by Lauren Monardo, one of the sixteen artists that worked on JHZ. I interviewed Stephen about his experiences as a first-time comic book writer/creator/self-publisher (he has a deal with publisher Alterna Comics as of last October) and as a dirty, sinful blasphemer. 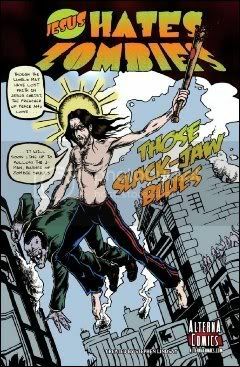 Jesus Hates Zombies is a beautiful book with a fantastic selection of artwork and funny, irreverent writing. So what’s it about? How about we jump into the transcript of the interview, where you can use those considerable powers of deductive reasoning that you’ve got, there. What d’ya say? Great White Snark: In my mind, Jesus is a bearded, soft-spoken hippie. In your mind, he’s apparently a bearded, foul-mouthed, ill-tempered Bruce-Willis-in-Die-Hard type. Please to be describing the influences that shaped this version of the J-Man. Stephen Lindsay: This version of the J-man pretty much came from my desire to really skew people’s perception of him. I mean, really, he’s the type of figure that EVERYONE associates with the soft-spoken hippie. So to completely turn that around is a huge part of the fun for me! And I think that’s the part of me that really comes from a deep-seeded love I have for any and everything Mel Brooks has ever done. He takes notions and ideas and stereotypes and makes people look at them differently, all the while making them laugh. That’s what I want to do. GWS: Ok, whew. I’m glad it didn’t involve a nun and “bad touch”. Moving on. I’ve always wondered: what does the “H” in “Jesus H. Christ” stand for? GWS: Wow, Ok. I thought it’d be something like “Helen”. He just strikes me as one of those dudes that has a girl name for a middle name. How did a first-time writer like yourself attract sixteen different talented and distinctive artists to work on your book? Exactly how many of your unborn children have you promised to give away? GWS: Dude, Craigslist? It’s all about Ebay for getting top-dollar for white slave babies. Jesus and his dutiful zombie sidekick Laz bring entertainment and humor back to the “odd couple” concept that had been so dramatically damaged by Will Smith and Martin Lawrence in Bad Boys II. What inspired a character whose faith outweighs his compulsion to eat brains? 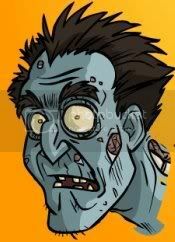 SL: See now, I thought it was dramatically damaged by Jackie Chan and Chris Tucker… Laz came about when an artist friend of mine brought up the notion of a zombie that retained some faith. I really dug the idea and ran with it, making the character JC’s sidekick. I just love the notion that the only thing that believes in JC is part of the very thing he’s supposed to destroy. And I wanted someone for JC to play off, but I’m a lazy writer and didn’t want to have to worry about TOO MUCH back and forth dialog or what another character was doing all of the time… With Laz, I don’t have any of those worries since he’s fairly incoherent, and he basically just stands around. GWS: I guess it’s the way he stands around that strikes my funnybone. Simple minds, simple pleasures. Have you ever had anyone refuse to work with you on religious grounds? Have you generally taken any flack for being the sacrilegious son-of-a-so-and-so that you are? Am I going to hell for talking to you? And yes, you’re going to Hell for talking to me. GWS: Yeah, but I’m going to Jewish Hell. Which, I’ll have you know, isn’t that hot. Otherwise we’d have something to complain about, and oh, how we do enjoy our kvetching. More entertainingly-sinful goodness in Part 2, tomorrow! GWS you are a master interviewer. I had no idea that Jewish hell was air conditioned! New technology can be scary. Are you scared of bicycles, too? Awkward Family Photo: LARPING STYLE!